IMPORTANT: For product supporting issue, please go here (OKION.com/support) for further information. 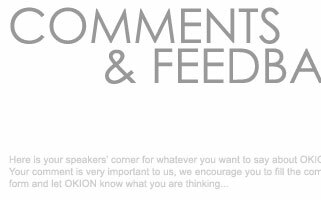 Your comments and suggestions about OKION products and services (or indeed anything to do with OKION) are highly appreciated and welcomed. Please complete the form below. When you're finished, select Send Mail at the bottom of this page. Note: DO NOT press the [Enter] key to finish a field. Press the [TAB] key to move to the next field -or- click the next field with your mouse. When complete, click the [SUBMIT] button at the bottom.